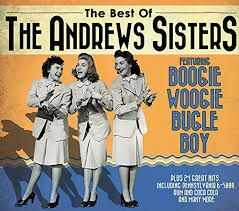 Boogie Woogie Bugle Boy in the key of C as inspired by the Andrew Sisters version custom arranged for 5441 big band and SSA women’s trio feature. This is a simple basic version of the classic with easy band parts, the classic trumpet solo as originally played and the classic SSA vocal version. This piece runs about 3 min. but could be expanded to include more instrumental solos. Note that there is only one simple rhythm/piano part for piano, bass, drums and guitar, which does at times use only chord symbols. See the score sample for a view of the rhythm part and how it changes from piano to simple rhythm. Listen to the audio midi mp3 which again does not include rhythm parts, but should give you a good idea of the horn and vocal parts.